This was the opening film of this year’s Dead by Dawn Horror Film Festival and it certainly took a long time to get to the big screen. 15 years to be precise. Certainly not many films have as interesting a production history as this one with the film being largely self-financed by director Andrew Getty, heir to an oil fortune, and the film being largely filmed on sets built in Getty’s mansion. Principal filming began way back in 2002 and took 6 years to complete while Getty tinkered with the film in post-production for many years before tragically passing of a drug overdose in 2015 at which point editor Michael Luceri put together to the final cut which was shown here. That is really just the cliff notes version of the storied production but with that much going on behind the scenes it would be easy for the film itself to be a disappointment but while it is by no means perfect and has some major flaws it is certainly interesting and certainly suggest that Getty could have been an intriguing horror director if not for his passing and it would have been fascinating to see what he went on to next. The plot is pretty straightforward as the central character Dennis (Frederick Koehler) is an isolated mentally disabled man living with and cared for by his older brother John (Sean Patrick Flannery). John puts an old fashioned mirror in Dennis’s room, apparently to help drive the price of the house up, much to Dennis’s disgruntlement. 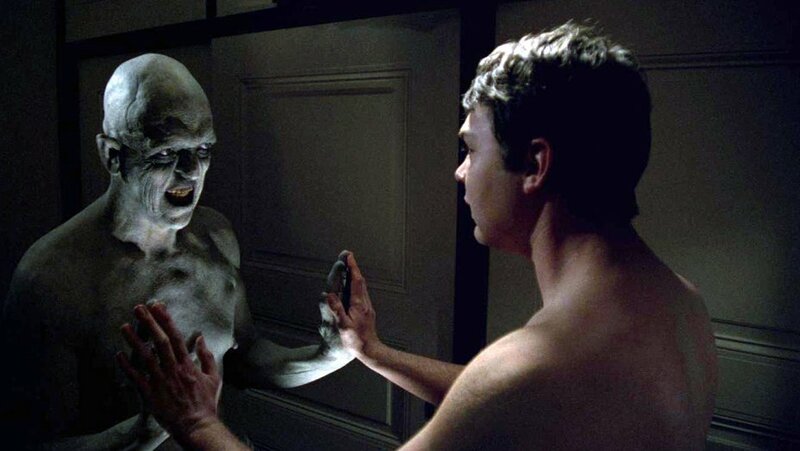 It is not long after this Dennis is befriended by a malevolent spirit in the mirror that appears as his own reflection but soon it start coercing into an escalating series of violent acts. That is really your lot in terms of plot but the director appears less interested in narrative and more interested in atmosphere and making it hard to find the seams of what is supposed to be happening for real and what is just a dream. Dream logic is a difficult thing to put on film and it is not perfect here but it is good at giving that sense of what dreams are like. The opening scene that illustrates one of Dennis’s childhood recurring dreams set in a carnival in the dessert is particularly effective. To say the film is something of a mixed bag would be a somewhat grand understatement as the atmosphere of the movie is great and a lot of the practical effects are excellent however the narrative is a bit all over the shop, unlike the practical effects the CGI effects are rubbish and some of the stilted acting and tin-eared dialogue are almost “The Room”-level bad. 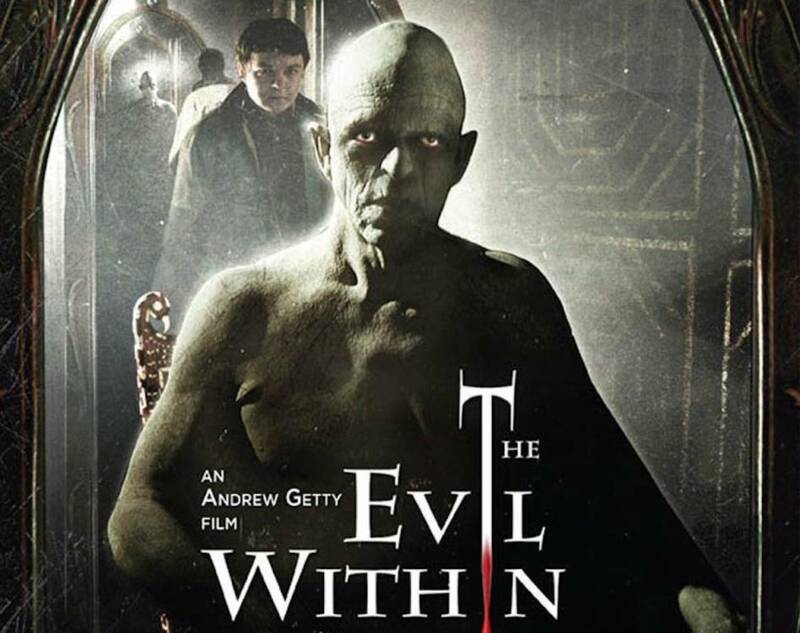 To be fair some of the performances are decent with Michael Berryman is impressively creepy as the evil spirit/demon Cadaver (not particularly a stretch for the man granted) and Frederick Koehler doing pretty well in dual roles. Although the role of Dennis himself is problematic as it is hardly a sensitive portrayal of a mentally disabled character and someone will wince at how freely epithets like mongoloid or retard are thrown around (usually by Dennis himself which may make it slightly better?). Overall: If nothing else this film certainly is not boring as it is packed with striking hallucinatory imagery and had the potential to be excellent if not for the fact it is so frequently paired with ear-scraping writing and plywood acting. After the screening there was brief Q&A with Editor Michael Luceri who, as mentioned, completed the film in the stead of Andrew Getty after his death. He discussed his relationship with director and the complexities of the production taking place over such a long time. He was highly complementary of Mr Getty and it was easy to tell that they were good friends and he had a lot of respect for him. 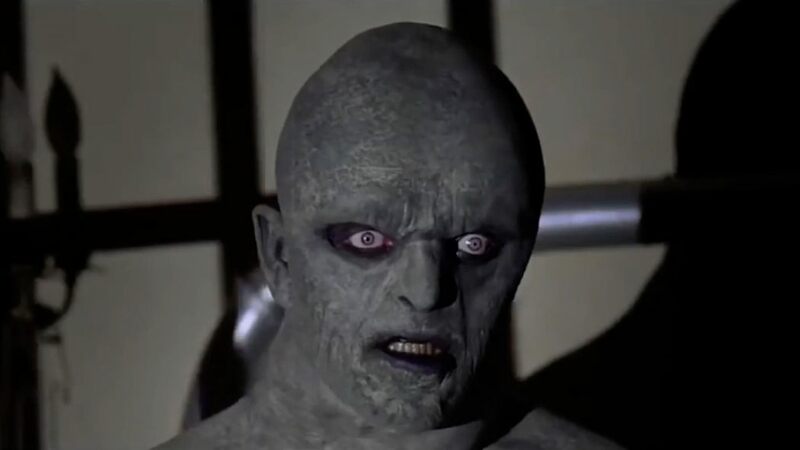 Also as a surprise for the audience Luceri got Michael Berryman on the phone to take some questions from audience which was very entertaining particularly as Berryman regaled the audience with a couple of tales about his childhood sleepwalking and dreams. With one about the time his mum almost shot him for real as he was creeping the hallways and another about his dreams of flying and fighting Godzilla! Which was certainly a fine way to kick off the festival. Previous Post Slime House TV @ HorrorCon UK – Ep04 – Doug bradley Interview!